Last Sunday we set our clocks for standard time. There are several home maintenance items we need to think about this time of year. 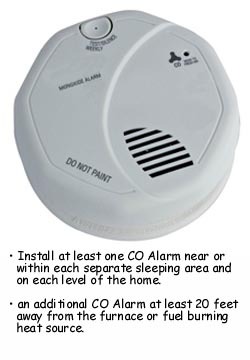 My number one item on my list, carbon monoxide (CO) detectors. If you are a realtor we have worked with in the past or a client, you know how important we think these are! According to the CPSC, in 2002 there were 188 deaths from CO.
We all know about smoke detectors, and they are important, but CO is invisible and deadly. Buy the cheap, battery powered ones, as they are disposable and expire in 7 years. You can order cheap detectors here starting at less then $10. If they ever go off, believe them since you can't smell or see CO. Get out and call the fire department. Consider any backdrafting hazards in your home. Be sure all appliances have adequate air supply and cold air return on furnaces are not picking up combustion gasses. See more regular maintenance worksheet for homeowners here. If you find this information useful, don't keep us a secret!